If you don't want to sync all of your folders in OneDrive to your computer, you can specify which folders you'd like to sync. 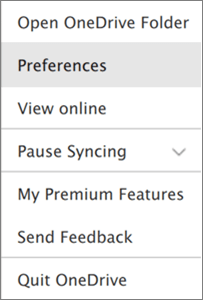 You can choose which folders to sync only if you are using the new OneDrive sync client. Not sure which sync client you're using? Got Windows 10 or Mac 10.14? Then what are you waiting for? Use Files On-Demand for Windows or for Mac today! Note: You might need to select the Show hidden icons arrow next to the notification area to see the OneDrive icon. Select the Account tab, and select Choose folders. 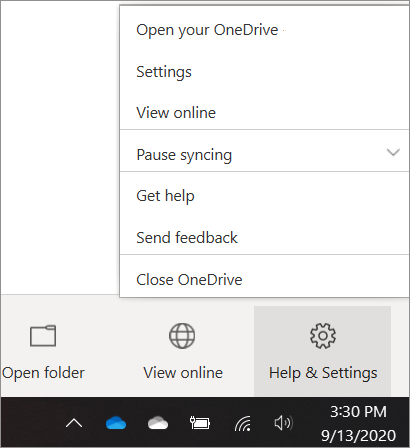 In the Sync your OneDrive files to this PC dialog box, uncheck any folders you don't want to sync to your computer and select OK. Note: You cannot add non-OneDrive folders (such as C: and D:). Select the OneDrive cloud icon in the Mac taskbar notification area. 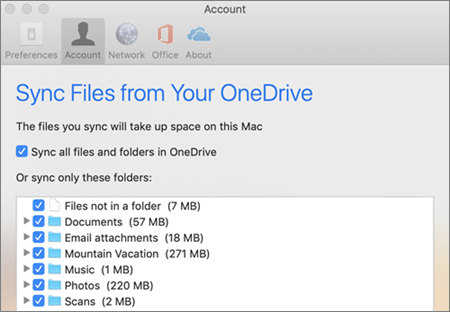 In the Sync files from your OneDrive dialog box, uncheck any folders you don't want to sync to your computer and select OK. If you uncheck a folder you are syncing to your computer, the folder will be removed from your computer. The folder and its contents will still be available online. The sync settings you choose are unique to each computer unless you're syncing everything everywhere. Also, if you're choosing folders on two computers and you create a new folder on computer A that you want to sync to computer B, you'll need to go to computer B and select the new folder there.